I’ve got a scheduled surgery coming up next week. As a breast cancer survivor and the mom of two C-section babies, this is not my first experience going under the knife. Making the time and space to recover from surgery is tricky—especially if you have little ones in the house and are used to being the person caring for everyone else. With a little advance planning, though, you can set yourself and your family up for success. Here are some of the strategies I’ve developed to make recovery from surgery a little less daunting. I don’t know about you, but I find it so much easier to rest and relax when my house is in order. Take some time to clear lingering clutter. Make a few of your family’s favorite meals and freeze them. Stock the fridge and the pantry. Clean the kitchen and bathroom and clear out the laundry hampers. Schedule payment for upcoming bills. This makes the couple of weeks before surgery a bit crazy, but it ensures that you have much less to worry about after surgery. Where will you be spending the bulk of your time as you recover? Will it be a bed? A recliner? Will mobility be enough of an issue that you need to consider renting a piece of furniture or moving what you have from one floor to another? Once you’ve selected your space, arrange to have what you need close by. Consider stocking your area with little luxuries like chapstick, hand cream, and magazines. Make sure your cell phone or laptop charger is long enough to reach the nearest outlet. Your recovery from surgery will go much more smoothly if you can rely on your village for help. Often in the early days, your mobility is limited, and there are limitations placed on the amount of weight you can lift. You might be on medications that keep you from thinking clearly. You might not be able to drive. Is your partner able to take some time off of work to stay with you? Can a parent, grown child, or best friend come to stay? Can a series of neighbors or local friends take turns checking on you? The service Meal Train has a ‘Plus’ tier that is a wonderful investment. For a mere $10, you can not only invite others to sign up to cook you a meal, but to complete other tasks as well. You might ask friends to stop by to sit with you, help drive you to an appointment, or watch your kids for an hour or two. It feels awkward sometimes to ask for help, but remember that your friends want to support you when life is difficult, and they appreciate it when you give them a specific way to do it. You’ve got the rest of your life to ‘pay it forward’ and return those favors. If, for whatever reason, you won’t have friends or family to help, do some research into professionals who can support you. Make sure you have a list of home health care services, babysitters, house cleaners, meal and grocery delivery places, and transportation services. You don’t want to be trying to research these things when you’re in recovery. I make a special list of time-consuming sedentary activities to complete while I’m recovering. It includes reading books that have been on my list forever, deleting photos and videos off of my devices, researching projects my family is undertaking, writing new blog posts, etc. I loved this exhaustive list I found on Pinterest of 56 Things to Do While Recovering from Surgery. It’s rare in life to get forced down time, and it’s wonderful if you have more to show at the end of it than seasons of binge-watched shows on Netflix. How will you keep your family and friends posted on your surgery and recovery? How will you let them know you are ok (or not?) Can you select one family member or friend to act as communications director? A group text message, email, or Facebook post can easily keep large groups of people that care about you informed. Talk to your kids in an age-appropriate way about your upcoming surgery. Let them know that you probably won’t be able to play with them in the ways you’re used to for awhile. Remind them that they will have to give very gentle hugs and might not be able to do things like sit on your lap. If you have children that are too young to understand this, consider having them stay with a friend or relative for at least the first few days after your surgery. A few of my favorite toiletries, including my favorite lip balm, body wash, and moisturizer. (The hospital will provide basic toiletries, but it can be nice to have something that you love to make you feel a little more human). With all of the tasks you are trying to undertake to prepare and all of the anxiety you might be feeling regarding your upcoming surgery, it’s easy to allow your health to suffer a bit in the weeks prior to surgery. Your body needs to be strong in order to quickly heal itself, though. Try to remember to take your vitamins, drink plenty of water, and eat healthy, balanced meals. Do your best to make sure you are getting adequate sleep each night. I think this area is often overlooked, and it is vitally important. Our mindset and our expectations of how a situation will be have such an effect on our actual experience. Assuming that something will be difficult or terrifying will often make it so, while assuming that something will be totally doable results in that outcome instead. Many resources exist which use meditation and affirmations to prepare your mind and body for surgery. I have two that I can recommend personally. If you are preparing for a Caesarean birth, Hypnobabies has an excellent Caesarean Birth Preparation MP3. For other surgeries, I love Belleruth Naperstek’s excellent Successful Surgery Guided Meditation CD which really helps me feel a lot calmer as I prepare for the event and which will surely help me to heal quickly and easily afterward. 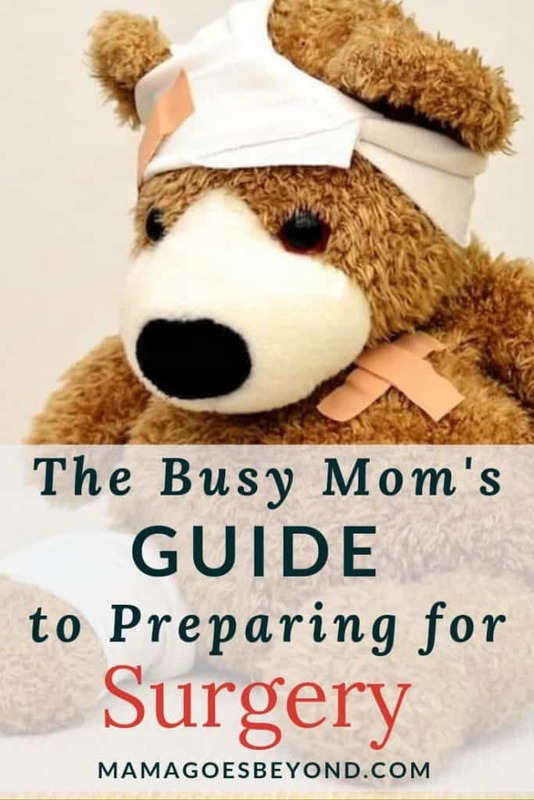 I hope this list of ways to prepare your home, your family, and yourself for surgery has been helpful.